It’s amazing what you find in a basement sump! 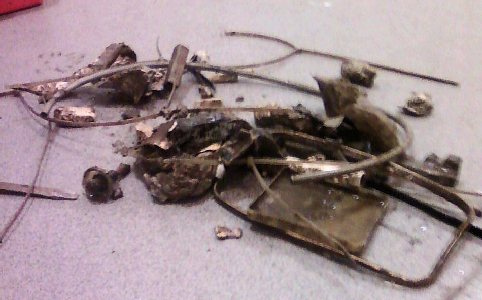 It’s amazing what our engineers find when they are cleaning out sump pump units. Here we have a photo taken by one of our London maintenance engineers whilst performing a ‘Clean & Check’ pump service on a commercial pump unit in a London basement. The basement waterproofing system that was in place did not have any filters on the inlets, allowing all manner of things to enter the sump pump unit and potentially cause problems to the impeller. All the items you can see in the photo were actually stuck in the impeller! Thankfully the Basement Sump & Pump Co got to this pump in time but if left funchecked performance would have been seriously impeded creating a potential flood risk. To make sure your basement sump and pump is in tip top condition simply call us to arrange a ‘Clean and Check’ – don’t forget if you do not get your pump serviced you may also be invalidating your guarantee! Simply call 0800 019 9949 or complete our on-line request form for more information.